In 1997 a dedicated group of tennis players and other volunteers from Ramsden decided to try to raise the necessary funds to provide the facility of a Tennis Court for Ramsden. With the money they raised and with the assistance of additional funding from West Oxfordshire District Council and Sport England, the Ramsden Tennis Court was completed and opened in 2000. When the idea of the village tennis court was first discussed, there was some doubt as to the usage it might enjoy and whether it could be sustained. However from the outset the court has been a great success. The club has getting on for 100 members, an active social programme, coaching and is a regular competition winner. 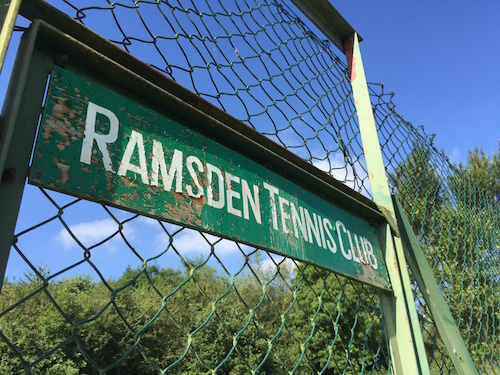 Ramsden Tennis Club remains completely self-financing, with all funds raised from membership and visitors fees, grants and the efforts of the Committee and supporters. New members are always welcome regardless of whether they reside in the village or not. Tennis is played all year, by all ages and in virtually all weathers. In 2012, after nearly 12 years of continuous wear and tear, the court was resurfaced by the club for the next decade of use by its members. Space was reserved for a second court in 2009 and currently discussions are underway to move forward with this plan when funding allows as outlined at the Annual Parish Meeting in 2015. The monthly ‘Ramsden Tennis Supper Club’ was launched in January 2017 to raise funds initially for a small Shelter/Clubhouse, the design of which is still to be determined, when the target figure is reached. Repainting of the court surface has now taken place at a cost of £4000. Much extra expense being incurred as no water supply exists to the playing field ! So, if you're a budding Andy Murray or a Serena Williams in the making; or if you are a complete novice, who fancies a gentle knock-about, come and join us. The tennis court can be found at Ramsden Playing Field. From the centre of the village, proceed along Akeman Street with the Church on your left. The playing field will appear on your right. Parking may be restricted to outside of the field gates in the event of exceptionally wet weather. The court is available to both members and non-members alike if booked and paid for by a current member. Non-members £3 per session (must be accompanied by a member and pass the fee to a committee member. The long established WYCHWOOD LEAGUE is underway with the villages of Moreton in Marsh, Charlbury, Stonesfield, Bourton Vale and Chipping Campden. 33 games take place on two courts per match. Watch this space for results as the matches progress throughout the summer. If you would like to take part in the matches this year please contact Sue Tucker (tennis@ramsdenvillage.co.uk). Played in Charlbury on Saturday 29th September. We held the club New Year Supper for 20 diners in the Royal Oak, Ramsden on the 12th January 2018. The club was allocated 3 pairs of tickets this year by the LTA. These were for Centre Court semi-finals, Court l and Court 2 - another good reason to join your local club. This tournament was won by Howard Searle. This event will take place on September 15th 2018. A monthly supper club has been established to raise funds for a shelter/clubhouse. So far, 16 have been held raising over £1,700 to date. The tennis court has been repainted during 2017 at a cost of nearly £4000.00 from club funds and is now in tip top condition. Will take place on October 21st 2018. Has been booked for November again, with additional players coming this year. Certificate Number 001626258850 issued 13th August 2018.